There are some things that are as USA as can be and one of of those things (or people) is Kid Rock. And on Saturday afternoon Kid Rock was seen with President Trump golfing in Florida. And really what this is all about is the pants. Kid Rock is a national treasure. Look at the picture and we will examine. First of all here’s the Twitter post. Here is a closer look at the outfit. Alright this is majestic because of many reasons. 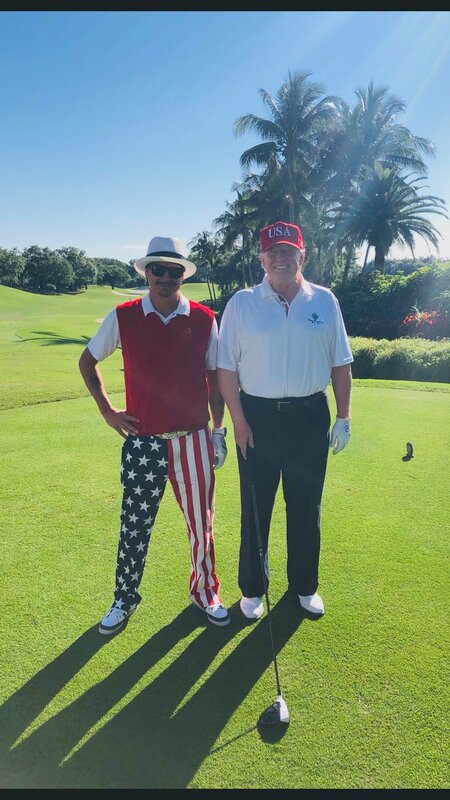 One, Kid Rock is wearing literally all American Flag Pants because he is golfing with the POTUS. This line of thinking is perfect. His sneakers are just amazing. And Trump, of course he’s wearing a straight up USA hat that looks like it was made in 1994 and he’s had in his closet since 1994. I swear Trump’s hat looks like he bought it in his first ever trip to the USA and bought it as a souvenir and wears it to family boating trips. Legendary choice of attire by both parties.